Some of the richest prophecies about the cross of Christ can be found in Isaiah chapters 52 and 53 (the last of the 'Servant Songs'). Take time to go through these familiar yet extraordinary chapters in the run up to Easter with this Lent devotional by Tim Chester. You will be thrilled and challenged as you see how Jesus matched every part of every prophecy, and brought glory to his name through his beautiful sacrifice on the cross. Contains 47 days of short, stirring reflections as well as a link to an original song, See Jesus Stripped of Majesty. 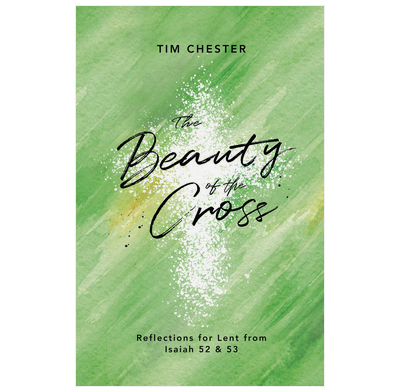 Written by Tim Chester, author of the best-selling Lent devotional "The Glory of the Cross" and Advent devotional "The One True Light". Here is a book to treasure and to share. Tim leads us on a journey through some of the Bible’s most precious chapters, for a rediscovery of the Christ who has walked our road, and who goes with us still. The Beauty of the Cross will be a rich blessing to you. This is a book to savor! Tim Chester has done an exquisite job in walking us gently through the richness of Isaiah’s vision of Jesus Christ, the Servant of the Lord, as he walks to (and through) his death in our place. Beautifully paced, theologically rich and deeply rooted in the real world—take it, read it slowly, and drink in its Christ-saturated truth! This compelling reflection on Isaiah’s extraordinary portrait of the Servant has a simplicity and directness which will provoke surprise, gratitude and worship. Pastoral and devotional in tone, it illuminates these remarkable chapters through thought-provoking illustration and application which will warm the heart, strengthen faith, and encourage mission. A wonderful resource for spiritual renewal! Chester's deep love for God and His Word shines bright in this wonderful 40-day devotional. Some excellent devotions for Lent. They get right to the heart of Easter, and right to the heart of the cross, and feel consistently relevant and challenging. It is always helpful to spend time just reflecting again on the beauty of the cross, and this book helps you do it in a way that is engaging and accessible, and cuts right to the heart. It would have been nice to have some more questions for reflection, but the content of each day is enough to get the heart and head working. Our church tradition does not celebrate lent, but I like to follow the Easter story, so bought this book this year to discover that it is so much more than just Reflections for Lent! The Reflections on Isaiah 52 and 53 are slow and deliberate pointing to the Cross, showing the personal cost the suffering servant paid, showing the sufferings as a measure of His love for us, showing how Christ came to stand with us in our sufferings, as Chester points out, it is personal with Isaiah’s use of the pronouns ‘we’ and ‘us’. These Reflections show the surprise, the shock, the stand-on-its head way of salvation Jesus executed for us on the cross which cause us to pause and wonder. Each Reflection is about 2-3 pages long and concludes with a short prayer, a hymn or poem for meditation. This is book is not just for lent, not just for Easter, but for anytime we need to slow, meditate and take a fresh look at the beauty of the cross.